Thank you to Debra Brown for providing an audio copy of this book, both for interest and review. It's no secret that I am a big fan of audio books, though usually fiction, this is my first nonfiction audio. 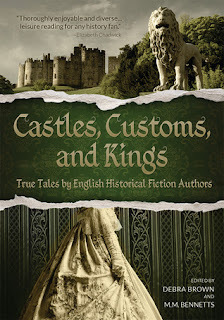 Castles, Customs and Kings isn't a short audio coming in at almost 26 hours, but in no way did it drag or become boring. With each chapter, written by various HF authors my attention was kept throughout. Being a big fan of historical fiction I was anxious to read this and am happy to that I was not disappointed in the least. Going through time chronologically this book had me entertained and inhaling a vast amount of English history. I was treated to stories about things I was a little familiar with, other times learning parts of history foreign to me. It was evident that each of the authors participating in this writing, had done a large of research as was displayed with the various chapters. I could feel the authors enjoyment of their subject matter, it felt like they wanted to make sure the reader enjoyed it also. The chapters were not long or drawn out but written with concise and meaningful text. The book ends with a list of each author and small biography, which I appreciated. Some authors I am familiar with and can say my tbr pile has grown with new ones. If you are a fan of HF then this book is for you. Thanks so much, Margaret, for the 26 hours of time listening plus the lovely write-up. It is much appreciated. I hope your followers enjoy the book, too!